Last year a friend and gardener extraordinaire, Philip Jenkins, told me to try a pansy called ‘Purple Rain.’ Its claim to fame is its ability to spread and fill a 12-inch area of the garden or to cascade down the sides of hanging baskets or containers. 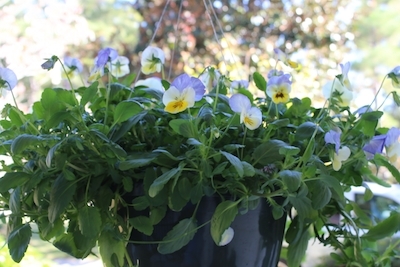 This year, along comes something a little different then ‘Purple Rain;’ Trailing Pansies. I talked with Mark McGrady, the General Manager and self-styled janitor at Seven Oaks Plant Shop in Irmo, South Carolina. 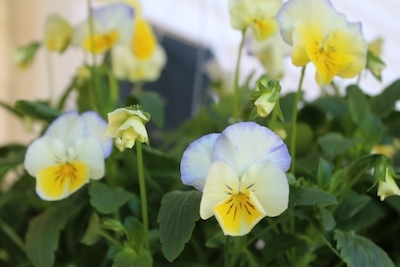 He gave me some insights into the trailing pansies on the market today and what might be ahead for these versatile plants, which are hardy to Zone 5. “In the trailing pansies there are two different series, Mark said. “ There’s the Free Fall series and then there’s the Cool Wave series.” Different developers offer these but they have very similar growth habit. “You can trim them to promote branching but they will continue to run because their natural growth habit is to run and spread said Mark.” The stems of the flowers as well as the plants themselves are quite long. They eventually flop over. “You will be fighting gravity” if you attempt to trim them into a ball shape. You could trim them every week to promote branching but “most consumers aren’t that dedicated, he said. “They just want it to set out there and do what it does and they don’t have to touch it.” They do need to be deadheaded¹, “for them to look their best,” he explained. “Grow them in any good-draining potting soil. They are not going to like wet feet. We have seen a tremendous problem with the (… moisture control soil) for fall and winter use. They just stay way way too wet.” Seven Oaks uses an equal amount of vermiculite, peat, and bark worked together as their growing medium. “I am sure you notice when you look at them, they are small bloom pansies, about 1 inch to 1 ¼ inch, a more similar bloom size to the old Crystal Bowl series,” Mark explained. ¹Deadhead: Cut off the spent flowers. Make sure you are removing flowers that have died and not the tight new buds that are just beginning to open.